Precious metals futures kicked of the new trading month on Tuesday with losses ranging from 0.9% for gold to 2.5% for palladium. Gold for June delivery dropped $12.40 to settle at $1,306.80 an ounce on the Comex division of the New York Mercantile Exchange. The settlement is the lowest since March 1. "The recent solid rally in the U.S. dollar index, which hit a four-month high today, continues to squelch buyer interest in the precious metals markets," Jim Wyckoff, a senior analyst at Kitco Metals Inc., said in a report. "Chart-based selling has also kicked in for gold and silver recently, as their near-term technical postures have deteriorated." Gold futures ranged from a low of $1,302.30 to a high of $1,317.40. 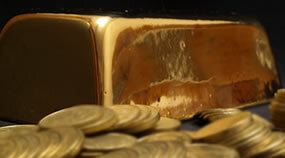 They dipped 0.3% on Monday, the final trading day in April — a month in which gold fell 0.6%. Silver for July delivery shed 27.4 cents, or 1.7%, to end at $16.127 an ounce. Silver futures traded between $16.07 and $16.37. They fell 0.6% on Monday but logged a 0.8% increase in April. July platinum declined $10.20, or 1.1%, to $894.20 an ounce, ranging from $893.20 to $907.40. Palladium for June delivery ended down $24.30 to $936.25 an ounce, trading between $934.40 and $960.10.